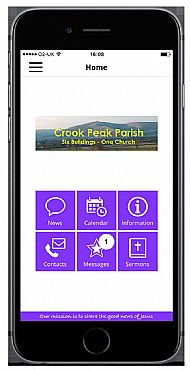 We have a really great App for you to find everything that you need to know about the Church in Crook Peak, in a couple of clicks. Where is the service this Sunday? Get a regular weekly reminder. Who can I talk to about a funeral? Click on a link to call them or email direct. What did Judith talk about last Sunday? Read her notes and see her smiling face. Who is speaking at Women's Fellowship? Get a reminder or click to find out yourself. What are the plans for the Churchroom in Weare? Look at the latest pdf plans and send in your feed back. Search for Chancel App in your App Store. Click Search and enter Crook Peak. March 2019. If you are existing App user you will need to update your app to the Chancel version, using the directions above. This is an essential update and will improve speed and use for the future.